A leading veterans’ organization is warning that a U.S. attack on Syria could lead to a nuclear war. Russian military forces in Syria will undoubtedly be among the targets of U.S. missiles. Russia has said it will shoot down U.S. missiles, and attack the “platforms from which they are fired,” i.e. U.S. ships. 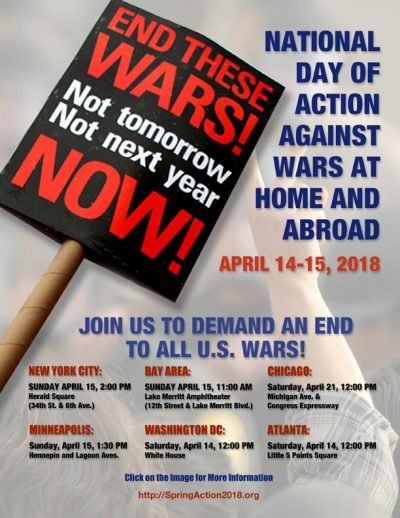 “Why the rush to war?” asked Gerry Condon, president of Veterans For Peace. “Why is the mass media cheerleading for war instead of asking hard questions? Why are Democratic and Republican politicians trying to out-do one another with calls for ever more massive attacks on Syria? “We are talking about a direct confrontation between the two nuclear superpowers,” said Gerry Condon. “Why would the U.S. risk nuclear war over dubious chemical weapons claims? “Veterans, GI’s and their families will not accept another war based on lies,” said Gerry Condon. “We will be protesting in the streets, in the suites, at media outlets and at military bases. All military personnel, from low ranking GI’s to the top generals and admirals, have an obligation to disobey illegal orders. Orders to carry out acts of war against a sovereign nation that is not threatening the U.S. are illegal orders. To arrange an interview, please contact Gerry Condon at 206-499-1220.